These two ships had possibly been used as ceremonial ships in the Egyptian Isis cult around 37-41 AD, favoured by emperor Caligula, but nobody knows. After sinking during Antiquity they were not totally forgotten. In 1446, Cardinal Colonna and the architect Alberti started searching based on oral tradition. Divers located the sunken ships 10 fathoms down, but it was too deep for salvage. New attempts to raise objects were made in 1535, 1827 and 1895. Finally, in 1929-32, the lake was drained by Guido Ucelli and the ships could be found and salvaged. Only the lower parts of the hulls remained. Many artefacts and two anchors were found, one 4 m long in iron and one 5 m long made of lead and wood. The ships were destroyed by fire in 1944. 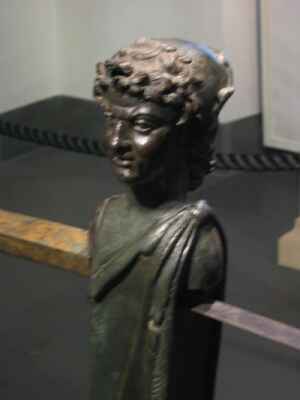 The surviving parts (bronze fittings) are now displayed in Museo Nazionale al Palazzo Massimo, Rome. A full-scale replica is under way. The Lake Nemi ships were two outsize pleasure barges built on the orders of the Roman emperor Caligula. They were not intended for use on the sea, but were built to use on the lake. Even so, they are built to the highest degree possible for Roman shipwrights. The barges were 70 m (200 ft) long and 18 m (60 ft) wide. They were built using the efficient mortise and tenon fastenings, with copper nails and lead sheathing along the hull. The barges were filled with marble and statues. 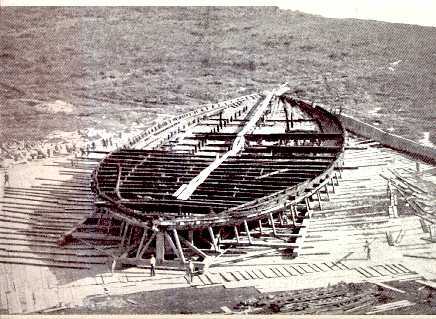 The main interest in the Lake Nemi ships is that they prove that the Romans were capable of building huge ships, as the grain carriers were reputed to be. Before the excavation of these barges, scholars had often ridiculed the idea that the Romans had that degree of sophistication needed to build a truly large ship. Among the things found with the boats were lead stocked anchors. Roman ships carried a quantity of these, but at the time of the Lake Nemi ships they were slowly being replaced by the iron anchors in the 2nd century AD. Lead stocked anchors, although efficient, due to being half of wood could rot, while iron anchors survived for longer.